This steamproof, waterproof and shatterproof timer features big digits. It counts up and down, 100 minutes by seconds. It also counts up after zero and has a stop and restart feature. The alarm is 60 seconds long and loud, to be able to hear from various parts of your shop or behind your counter. Also has a flashing light when alarm goes off. 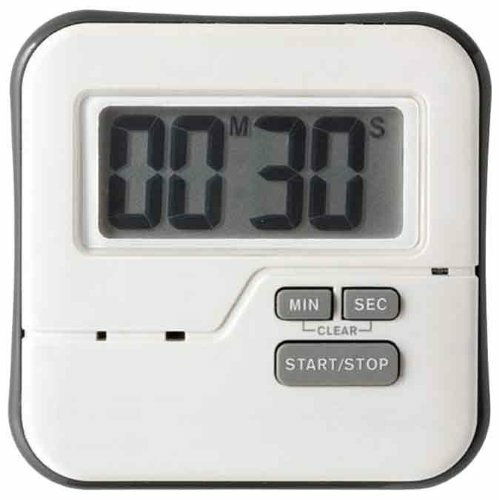 Timer features two different mountings - magnetic and its own stand. Two AAA batteries included. 3" x 3" x 1" size. Built in memory function - same countdown timing period can be repeated by pressing the start/stop button after the alarm sounds. If you want to set a new timing period, clear the alarm by pressing the min and sec buttons together. If you have any questions about this product by Espresso Supply, contact us by completing and submitting the form below. If you are looking for a specif part number, please include it with your message.